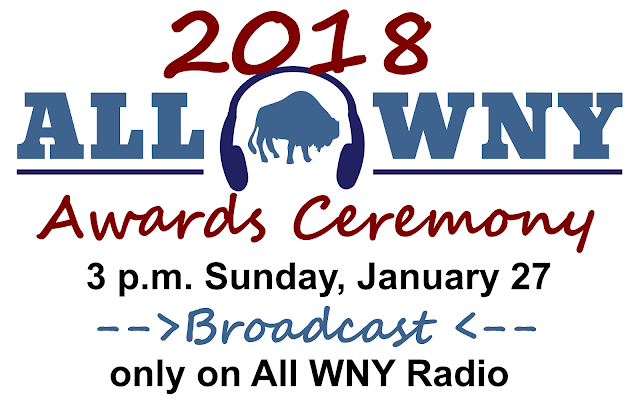 Following the recent weather-related cancellation of the All WNY Awards Ceremony that had been slated for Jan. 19 at Evening Star Concert Hall, the All WNY Awards committee has decided to forego an in-person ceremony in favor of a ceremony broadcast, which will air on All WNY Radio at 3 p.m. on Sunday (Jan. 27). The broadcast will include the ceremonial reading of nominees and winners from members of the All WNY Radio staff, along with music from the winners and possible acceptance speeches in select categories. Our reasoning for this is multi-fold but boils down to our not wanting to make the nominees wait any longer than necessary to find out who won. While we would have preferred to have had a live ceremony akin to the one that had been scheduled at the Evening Star, we simply could not get one scheduled in the near future at a time and date that worked for the committee. The basket raffle, which had been planned for the ceremony -- to benefit Crisis Services in memorial honor of our friend Greg Rinker -- will instead be held during the Blackened Heart Ball at Stamps on Feb. 15. We also continue to accept donations via PayPal. Thank you for your patience and understanding in the matter. We hope you'll all tune in on Sunday! Listen 24/7 on the All WNY app on iOS or Android, at listen.allwnyradio.com. on TuneIn or via your Amazon Alexa by saying "listen to All W N Y Radio on Tune In."